Although many bio manufacturing facilities were designed around Clean-in-Place (CIP) or Steam-in-Place (SIP) equipment and fixed stainless steel piping, adapting these facilities for new processes demonstrates the advantages of single-use-systems. 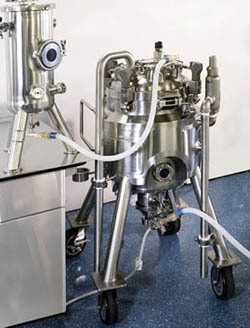 One major manufacturer implemented a new process which required flushing of a critical filter element prior to filtering their final drug formulation. This single-use, SIP filter is encased in a stainless steel housing that was not piped for a filter-flush step. Their solution was to design a single-use bag system with a Steam-Thru® II Connection inlet to capture the flush solution. This bag system is received pre-sterilized and routed through their cGMP raw material inspection and release process. When preparing the filter for SIP sterilization, the bag is connected via the Steam-Thru II to the filter housing’s bleed port. During SIP, steam passes through the filter housing, out the bleed port, into the Steam-Thru II middle port and out the lower port to a steam trap. Once SIP is complete, the Steam-Thru II’s valve is transitioned to the flow position creating a sterile flow path for collecting the flush solution. After the filter flush is complete, the Steam-Thru II’s valve is transitioned back to the steam position isolating the bag system and flush solution. Integrating single-use components with traditional stainless steel processing equipment can help manufacturers increase flexibility and adapt facilities for new processes while maintaining process and product sterility.